In reference to an exemplary bibliometric publication and citation analysis for a University Department of Psychology, some general conceptual and methodological considerations on the evaluation of university departments and their scientists are presented. 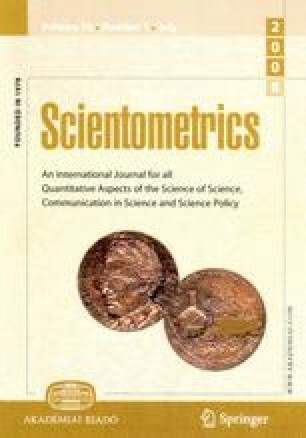 Data refer to publication and citation-by-others analyses (PsycINFO, PSYNDEX, SSCI, and SCI) for 36 professorial and non-professorial scientists from the tenure staff of the department under study, as well as confidential interviews on self-and colleagues-perceptions with seven of the sample under study. The results point at (1) skewed (Pareto-) distributions of all bibliometric variables demanding nonparametrical statistical analyses, (2) three personally identical outliers which must be excluded from some statistical analyses, (3) rather low rank-order correlations of publication and citation frequencies having approximately 15% common variance, (4) only weak interdependences of bibliometric variables with age, occupational experience, gender, academic status, and engagement in basic versus applied research, (5) the empirical appropriateness and utility of a normative typological model for the evaluation of scientists’ research productivity and impact, which is based on cross-classifications with reference to the number of publications and the frequency of citations by other authors, and (6) low interrater reliabilities and validity of ad hoc evaluations within the departments’ staff. Conclusions refer to the utility of bibliometric data for external peer reviewing and for feedback within scientific departments, in order to make colleague-perceptions more reliable and valid.